In the following the inner workings of two Canon EOS battery grips will be shown. The motivation to disassemble the grip came from the idea to gain control of the camera buttons and wheels without opening the camera body. By connecting a microcontroller to the dial wheel and the shutter button in the battery grip, functions not included in (or intentionally excluded from) the camera firmware, such as unlimited exposure bracketing, can be implemented. 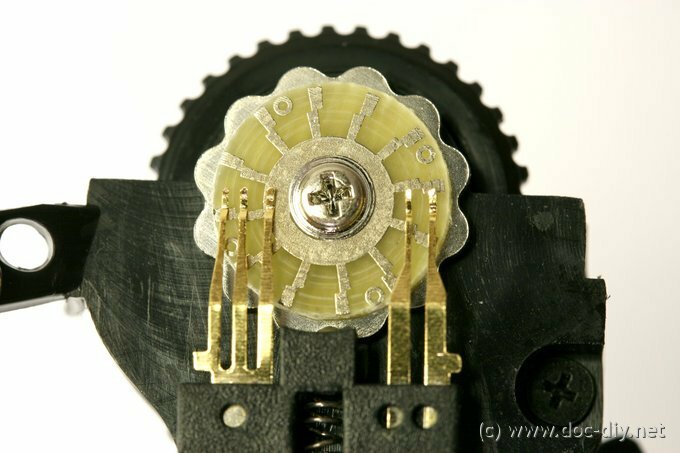 To release the dial wheel and shutter cover, two screws inside the grip must be loosen. The on/off switch disables the buttons and the wheel on the grip. It has no influence on the power supply. 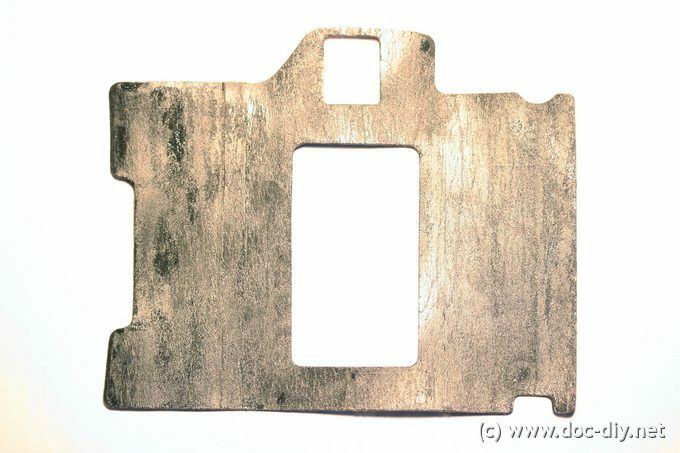 The four screws in the bottom plate are covered by a rubber sheet. The rubber can be pulled off easily. It is possible to re-attach it after reassembly without any difficulty. The glue stays very adhesive (and stinks terribly). The covered screws can also be located by looking through the battery chamber door. 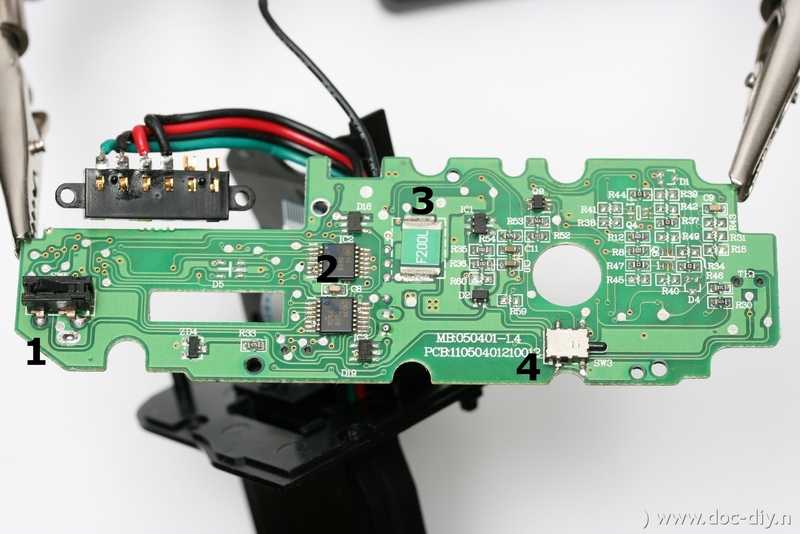 The following images show the PCB inside the grip. Fortunately there are no purely digital components on the PCB, meaning that the communication between the grip and the camera body is not based on digital codes as in the EF lens interface or the flash connector. Most of the electronics seem to deal with the control of the batteries (comparator, MOSFETs). I could identify all the important parts on the PCB and listed them in the table below. 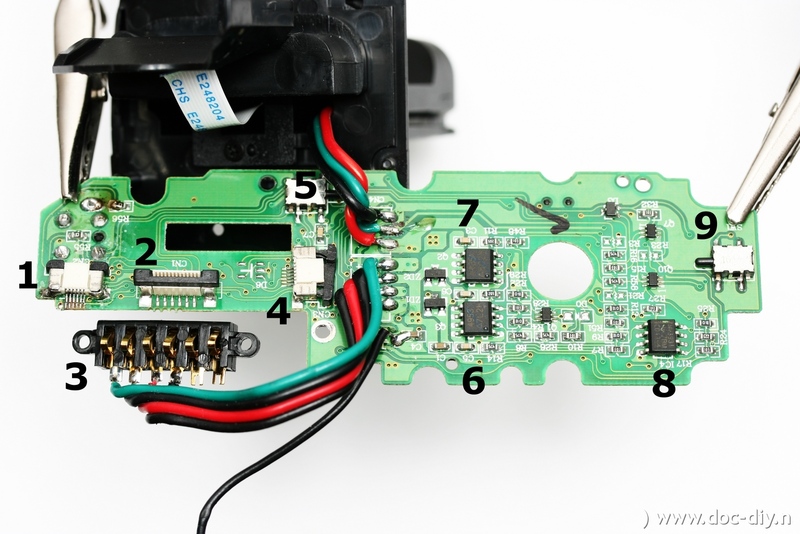 To remove the ribbon cables from the connectors, the latch must be released, compare 1 (closed) and 4 (open) in the top side image of the PCB. Ok, let's have a look on the most interesting part - the dial wheel. The functional principle is rather simple. There are three contacts sliding over a contact disk with a star-shaped conducting surface. One is in permanent connection, the others are connected with the star when the disk is rotating. Because the "arms" of the star are located at a different angle for both contacts, the rotation direction can be detected. For clockwise rotation (see image) the right contact will connect first, for counter-clockwise rotation the left one will be first. The dial wheel doesn't give that nice click like the original one in the camera body. It's a little bit to soft, but faster then the original. The following pictures were made by Norbert Löv during the modification of his original Canon BG-E2 battery grip for external bracketing control. Click on the thumbnails to view the image. The picture showing the dial wheel of the no-name grip is a bit confusing. It looks like the three contacts on the left are all connected. But this would render the whole wheel non-working since the third (middle) contact is constantly connected to the center ring. Could you clarify? Apologies for adding to a very old post, but I'm hoping somebody sees my cry for help! 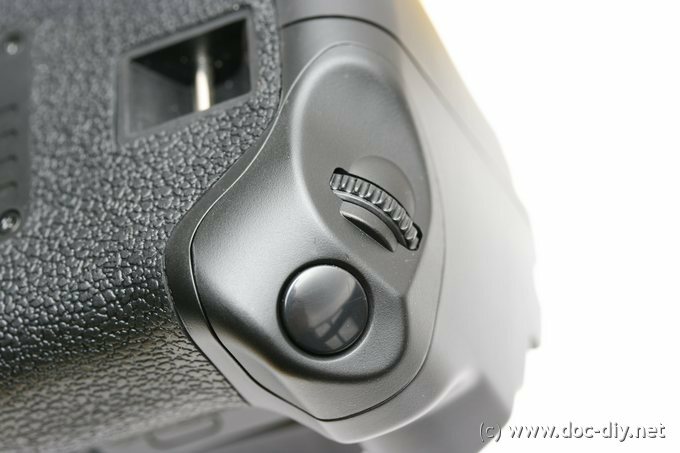 I have the BG-E4 grip for my 5D, and the - button (AE lock/zoom out) on the grip has stopped working. I use that button for auto focus and so I'm a bit stuck without it. Many thanks for the info on your project. Please let me know if you publish more on the project. What was the driving idea for the circuit? BTW: you can omit transistors pulling the wires down. You can do it just by chnanging a port pin of the AVR form input to output with logical zero. Please contact Norbert Löv for the battery grip connector pinout. please send me a mail or give me a email address if you wish to have the pinout of the 16 pin port inside the battery compartment in a 20D battery. phone to whatever needed by EOS). real pinout or information on this connector. 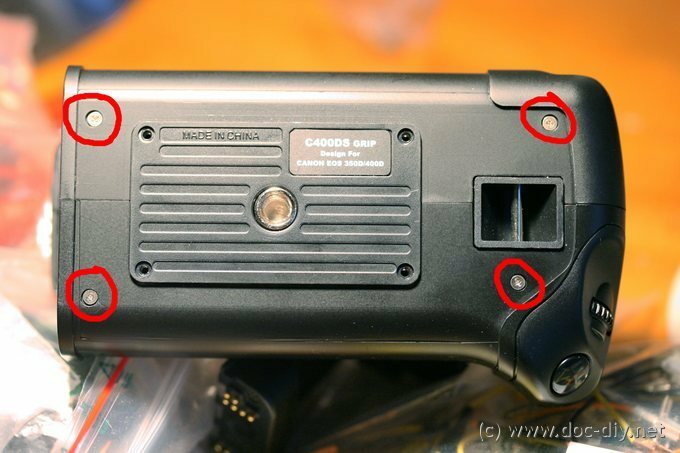 pinout of the battery grip? 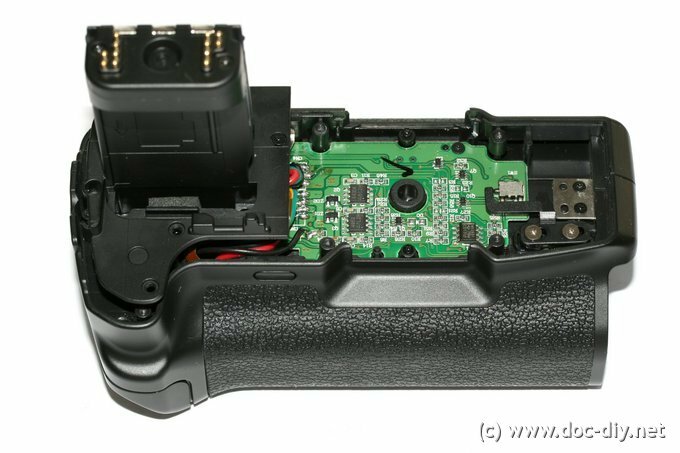 reading your posting about the innards of the battery grip i had one big question: what is the pinout of the control signals to the camera body. i assume that the switches are connected without electronics (except for the main switching array to the pins on top. but whitch pin is connected to whitch switch? just to say that implanting microcontroller in the battery grip is a way to go! I had the same idea and manage to complete it a few months ago with the help of my friend Aleksandar Zivkovic. Since then I'm using with no problems. We have been planning to also publish our work in a few weeks with new, improved version. If you need anything form us - we'll be glad to help! based on your HDR Jack1 Software and with the fuctions you send me included I have a HDR timer now which works great! Here another sample movie with a very fast expose time adjustment! P.S. : I drilled a whole on the left side of the grip and placed a switch there (look like the same switch you use in the HDR Jack2. Therefor I will buy a ATtiny85 today. In the moment I use the interval timer, focus impulse adjust expose time, shutter impulse take the picture. for the first tests I connect some wires to the focus, shutter and dial wheel contacts. I have control to the functions we need to adjust the camera by remote. 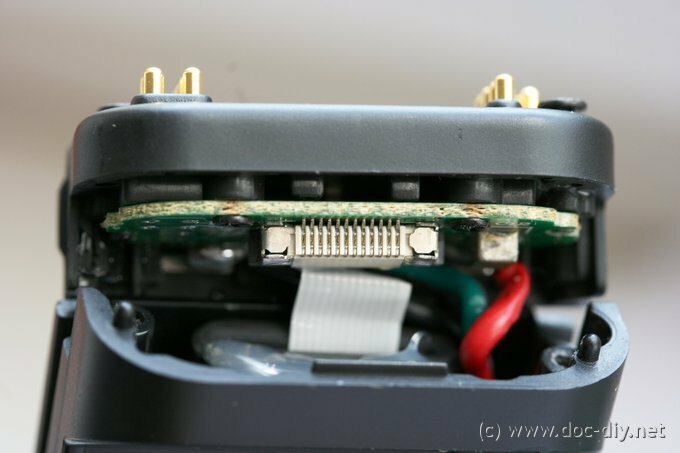 Here a link to the pictures which shows the disassembling, the soldering inside and the way my temporary cable comes out of the grip. When there is software and everything works fine, I will look for a nice connector which will be build into the case of the grip! I don't plan to build the AVR into the grip, even there is enough space. I would prefer a 5 pin connector which is build in the grip. The connector would be connected to focus, shutter, dial wheel contact1, dial wheel contact2 and ground), may a Lemo connector would be fine. With a connector you would be free in the choice what to connect. or even a cheap box with 4 switches as a wired soulution. Anyway, I'm sure a lot of people out there will be interested in something like this. I defently take my battery grip apart soon and connect wires to the switches inside! Is the middle contact of the dial wheel on ground level and short contact1 or contact2 to ground, or is it used as a 2 way switch? as owner of a 500D (which is listed with 1/8s as shortest EXP Time with HDRJack2) i'm very interested in this Project. Hopefully you'll find a way to get this up and running. I'm very interested in this project and it would be nice to share information. 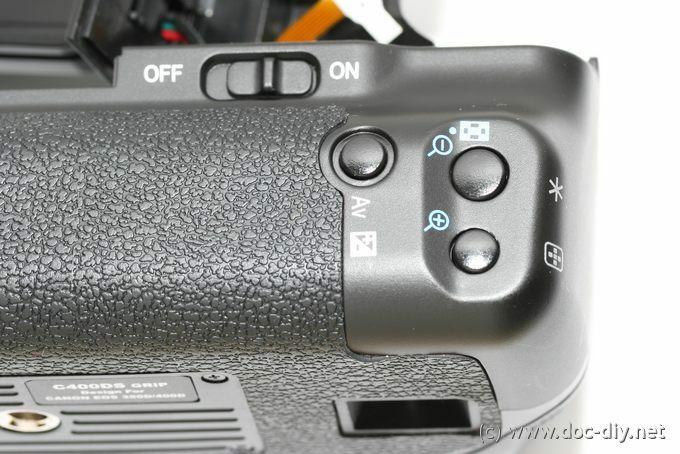 I think to connect to the switches in the grip will be a perfect solution to do exposure bracketing. It will produce correct exif information and give the posibility to do expose times less that 1/60 (which is the limit via HDR Jack on my 20D) in daytime. Please let us get in contact to discuss the details and to find out howmuch we can share!